Yesterday, I posted cara setting static ip address di mageia 3 menggunakan konsole (how to configuration static ip address in mageia 3 using console) and today I post cara setting static ip address dengan menggunakan GUI (how to configuration static ip address using GUI method) you can Increase your knowledge and connect into Internet But, If you configuration between client you have to get problem about Firewall. READ! 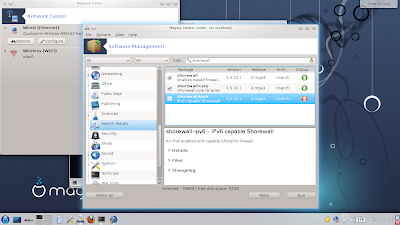 How to Configuration IP Address Mageia 3 Client to Client On Mageia 3 there are problems to turn off your firewall. How to turn off your firewall if you can't turn off that ? You can follow step by step in below. Let's go! a. Go to Mageia Control Center - Software Management - Install and remove software You must to remove your firewall software in your Mageia, I Mean shorewall. In Mageia 3 the name of firewall is Shorewall. Note : (default repository) put on Instalation Disk of Mageia 3 in your CD-ROM,then Install it! Complete! Thanks to read How to turn off your firewall if you can't turn off that!